Pinzolo is a wonderful place for ski holiday. The resort has plenty to offer you for a nice ski holidays in Italian Alps. It has well-groomed slopes and high tourism facilities. If also offer different services for your entertainment - igloo building for all the family, ski lessons, every Thursday night is snowshoe hike, also dog sledding and trekking, playgrounds, spa and many more services for your satisfaction. 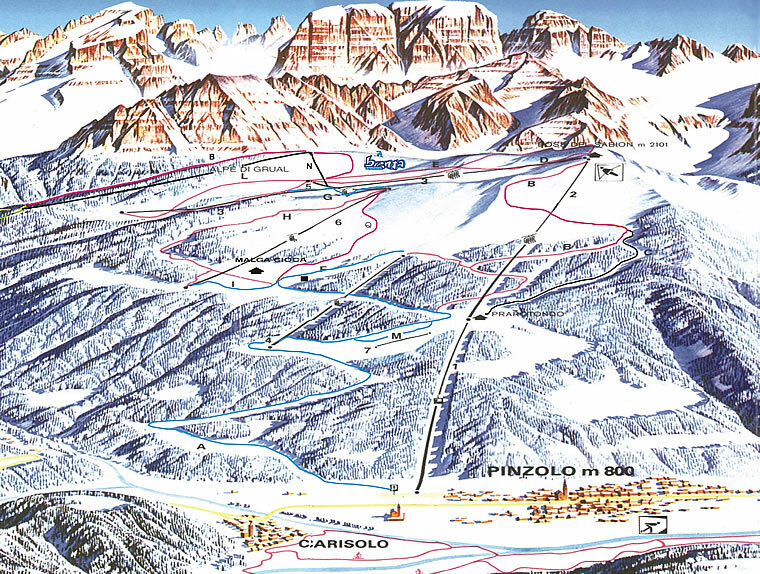 Pinzolo ski resort is located in northern Italy surrounded by Adamello and Presanella mountains. The resort was developed in 1960s and today is popular ski holiday destination. Pinzolo has rich history dating back from mediaeval times in religion and economy. The resort has also maintained and saved its traditions in figure skating and other winter events. Pinzolo season opening dates are subject to snow conditions. Pinzolo is perfect for beginners and snowboarders. Resort also offers good slopes for skiers for all skill levels. From first-timers to seasoned pros, there’s plenty on offer for everyone. If you are looking for a resort suitable for a whole family, you have found one. Pinzolo is ideal place for a family ski holiday, the resort offers several facilities for children and family. Children up to 8 years old can have a ski pass for free accompanied by its adult family member. Also family with 3 or more kids have a great discount on ski passes and other services. Alps2Alps is reliable, punctual and flexible transfer company in Alps region and we offer full package services of high quality transfers to different ski resorts in Alps region. If you are looking for low price high quality transfers to and from Pinzolo, you have found the right place. Book a transfer to your ski resort in advance to get the lowest prices and total peace of mind. If you can’t find the resort or the service you require listed on our website, be sure to get in touch with the team. If you want to get your trip to Pinzolo off to the best possible start, you know who to call!